This handcrafted wooden cooler was made by the talented and hard working, Joe Papotto – my neighbor. He builds all kinds of wonderful wood creations, but this to me, is his best work yet! He sold the cooler to a friend of mine and she asked me to stain and paint it. We came up with a plan. She wanted it to go on her back patio near the pool. 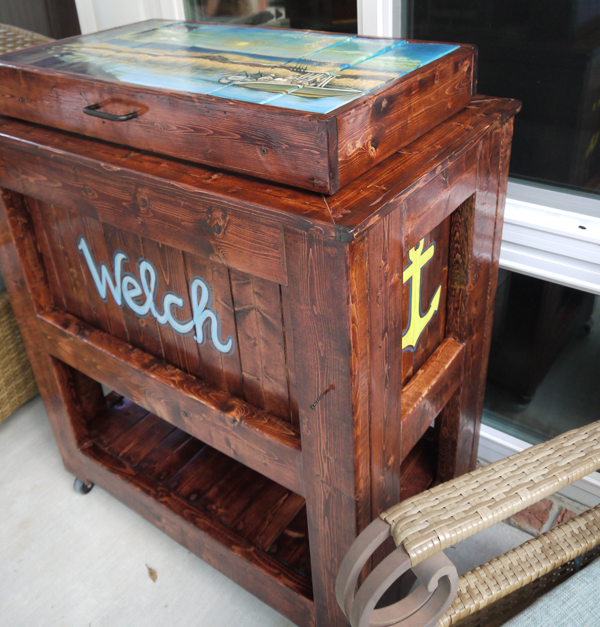 She thought it would be a great gift to her husband, who enjoys backyard parties, which would benefit from the convenience and class of a cooler such as this! He also loves being on the water – boating, fishing, and relaxing with his family and friends. We tried to incorporate all of these things into the cooler design. The stain color was chosen based on the other patio furniture that would accompany this piece. The anchors and last name were just little extras to tie it all together and make it more personal. Well, here it is. From start to finish. Enjoy! p.s. Joe and I will be offering these coolers along the Grand Strand and hopefully beyond, in the near future. Please spread the word!